I developed and implemented this drill sequence with my JACKRABBIT SPORTS swim classes in the fall of 2012, and it is the best one I’ve used to teach a 2-beat and 6-beat kick with perfect form. Even those with very weak kicks and tight ankles were able to learn the kick within an hour and do it reasonably well by the end of their second class. What inspired my work in this area was Richard Quick’s “Posture, Line, and Balance” coaching methods as well as Earnest Maglischo’s work describing kick motion and function. Then it was a matter of time (years) before I was able to determine what might bridge the gap between the motions I regularly see with adult swimmers and that of the pros. The key to this learning process is in focusing on when to LIFT the legs vs. when to kick. This DISTINCTION is crucial. The thought here will be to PULL AND LIFT THE OPPOSITE LEG using the hip muscles. Most adults have tight hip flexors and hamstrings which cause a drop-kneed kick that falls well below the hip line. Focusing on LIFTING USING THE GLUTES with a STRAIGHT LEG takes the hip flexors and quads out of the action as prime movers and uses the muscles that lift (and maintain) the LEGS ABOVE THE HIPS. Don’t worry! The DOWN KICK WILL STILL HAPPEN. You just won’t focus on it right now. Once you build the ability to LIFT your legs into position, you can focus on the down kick, but not before. Maintaining the legs above the hip line and RECOVERING A STRAIGHT LEG upward to the surface will reduce resistance to forward motion as much as anything else in freestyle swimming. For most adults it is the most important thing for them to learn in order to move from being a decent swimmer to better-than-average and beyond. REDUCING RESISTANCE should a main goal of all adult swimmers. Combined with a well executed arm stroke, these two focus areas will make you as fast as you can be. These are positions that are almost NEVER seen in beginner and intermediate adult swimmers. I was surprised to find that more than a few people walk in with this level of flexibility but almost no one starts out kicking in this range of motion. When I see it and ask about their background, they were usually good high school or college swimmers. All swimmers above are in the EXTENDED POSITION with their lower side leg raised STRAIGHT up to the surface. They have great hip flexibility. This is the ideal position from which to START your kick. It ensures the down kick (has a chance) to be inside your body line and not drop below your hips. This leg lift is seen happening as the pull is made, just as is suggested in the drill sequence below. Talk about a release of POWER! The entire body is stretched out from head to toe, ready to contract as the pull is made. For the vast majority of adults, this is a position that can and must be LEARNED. And it is hard before it becomes easy, or natural. Many times, hips atrophy from sitting all day, or won’t move into this position because ACTIVELY placing the leg behind the hip is a very unusual movement. It certainly moves there when walking and running, and more specifically when doing Superman core movements in the gym, but it is very different in a weightless environment without using the ground or having momentum carrying the leg back. JESSICA GONZALES, a participant in one of our JackRabbit fall 2012 Swim I programs was generous enough to allow me to post video of her doing these drills. (I apologize for the shakiness of my camera phone.) She is a good example of how you should strive to look in the water when learning these techniques. Let’s take a look at the sequence. Working through THIS SEQUENCE, allowing for a couple of 50s for each step, ADDS UP TO 700YDS. I’d recommend doing it RIGHT AFTER YOUR WARM-UP when you’re fresh and able to focus well. Then move into other work or a main set. Do the entire sequence a couple times per week for a month to integrate it fully into your swim stroke. You’ll be glad you did when your strokes per length start coming down and you’re able to get more power out of your kick as a result of much improved leg placement. The first four steps involve single-arm swimming. One arm is held straight out front while the other one works. 1) In the first iteration, Jessica works on rotation. She uses a steady kick and, as she pulls through, rotates her body up 45-60deg from the surface. This is a normal amount for freestyle. Her centerline, from the top of her head down to her feet, stays fairly stable. If you know you don’t rotate well, or have been told you swim “flat”, really overdo the effort here. 2) Before she can focus on lifting with her hip, she must take her quads and hip flexors out of the picture. This means not kicking. Since the drill is timed with the pull, she’ll attempt to hold her legs perfectly straight, and together at the knees and ankles, while she’s pulling. This means a couple kicks don’t happen. It’s brief, but you can see her legs stop moving for a moment. It may take you a few tries before you’re able to do this. Another way in is to stop kicking altogether, but this is difficult for those whose legs don’t float. Body position near the surface must be maintained. You need to be able to ACTIVELY STOP your legs. 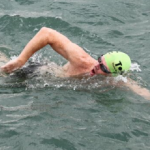 TEACHING UPDATE: In recent classes I’ve had swimmers stop their legs during the pull AND recovery phases of the stroke, kicking again once their hands meet out front. This takes out the possibility of a quick splay kick to help rotate back down. It also challenges them to stay very low during breaths so their body stays near the surface. WHEN I DO THE DRILL I put my toes together and straighten my legs before I start to pull. After the recovery I kick until I’m all the way back to the surface again. You shouldn’t start the next pull until your body is back at the surface. TEACHING UPDATE: Some swimmers will lift the leg too quickly and in the process kick down deep with the other leg. I’ve been catching people when they lift their entire foot out of the water and having them LIFT LESS so the foot grazes the surface. This is how it should ultimately be done and this focus point has resulted in them learning a narrow, hip-based kick much more quickly. WHEN I DO THE DRILL I lift my foot to the surface BEFORE I pull and feel the surface AROUND it AS I pull. Note: The above step is the most critical in the sequence. Don’t move on until it happens. 4) Having mastered the PULL AND LIFT, she moves on to a SWITCHING phase. She takes three strokes on one side, lifting the opposite leg, then three on the other. 5) At this point Jessica takes another small step towards a standard 2-beat kick. She performs a pull and opposite leg lift on one side, recovers that arm and kicks in the streamline position. Then she pulls and lifts on the other side. This requires focus, but you’ll be ready by this point. If you get “lost” for a moment, go back to pulling on one side only until you get the feel back for the pull with opposite leg lift. 6) This is a 2-beat kick. She pulls and lifts in rhythm from side-to-side. Initially, as you can see, her legs scissor a good deal and her lower leg is slightly below her body line. However, as the “upkick” or “lift” is reduced, and the upper foot stays just below or right at the surface, the lower leg will not drop as much. ALSO, once each foot is lifted it is ready to make a short, snappy KICK DOWN (somewhat visible in the next video). By making a kick that feels like “flicking water off your toes”, you can provide force to keep it from dropping as well as help your body rotate as you pull. For some people who have a difficult time differentiating between their legs, lifting may be required on BOTH sides at all times to keep them up. 7) This is a 6-beat kick. Jessica is thinking “lift, kick, kick, lift, kick, kick…”. She’s just adding a couple kicks in-between lifts. And, she’s doing a catch-up with her hands out front to simplify things (similar to Step 5). Once you get comfortable with the rhythm, you’ll be able to swim your regular stroke, no catch-up, and time your kicks evenly on both sides. TEACHING UPDATE: At this point, if a person can’t quite get the rhythm, I’ll have them swim and focus on a straight-legged kick with toes pointed. After using the hips to lift for the hour class their legs are in pretty good position. I’ll ask them to do this and see if they can lift their lower leg from time to time, seeing if they begin to hit the rhythm on occasion. I’ll give them feedback as to when they are doing it correctly, then continue with them until they are in sync most of the time. Week 1: Swimmer is able to stop their legs when pulling and recovering their arms. Occasionally able to lift the opposite leg up, in a straight position, when pulling. Week 2: Swimmer is able to consistently lift the correct leg into position with each pull. During full stroke, they are able to occasionally time the leg lifts correctly, and realize when they’ve got it wrong so they can start over. Week 3: Swimmer is able to perform the full stroke with legs lifted into position with the proper timing most of the time. They may still have to stop and kick on occasion, or take a few extra kicks between strokes, but otherwise are proficient.